Looking for big PPM results without the big price tag? You probably already know that CA Clarity™ PPM is the leading solution to manage your IT projects, align resources and track investments. Now everyone can adopt these best of breed capabilities to support business priorities and strategic innovations with CA Clarity PPM CODE 50. Join this webcast to learn how you can start your Project and Portfolio Management journey in just four weeks for as little as 50 users. 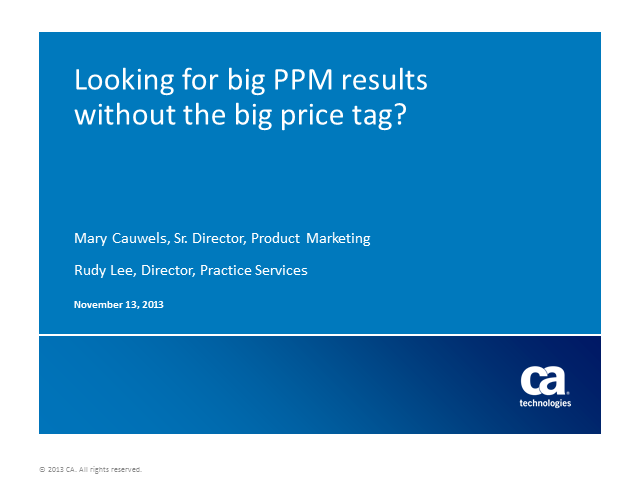 Title: Looking for big PPM results without the big price tag?